Eclipta alba has been added to a sesame oil carrier to produce a hair growth formula that is suitable for use by those with color-treated or sun damaged hair. Can also be massaged into the scalp and/or feet to induce more restful sleep. Ingredients: certified organic sesame oil and c.o. bhringaraj leaf. A pitta-soothing oil that is beneficial for calming and clearing the mind and enhancing peaceful meditation. 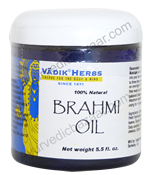 Brahmi is said to bestow intelligence upon its user and can be massaged into the scalp to promote awareness and mental function. Ingredients: Sesame oil, Brahmi leaf, Centella asiatica, Bacopa herb, Bacopa monniera.